You can get these changes from https://github.com/mutability/rtl-sdr/ (you’ll need to build from source yourself). There should be no application changes needed, just tune as normal. (gqrx needs the “no limits” option turned on) These changes work by limiting the tuner to a range of frequencies that it can reliably tune to, then allowing tuning beyond those bounds by making the 2832’s downconverter do the final bit of tuning. This can add up to 14.4MHz to each end of the range. Also, the tuner is switched to low-side mixing at the top of the range which gives a bit more range there. The practical range is limited by the width of the IF filter and aliasing effects at the extreme edges of the downconverter’s range. I’ve been able to pick up broadcast AM and amateur CW/SSB down to around 15.5MHz without too much trouble. I’d be interested to know how this works for others. Also.. these changes are likely to have broken offset tuning, direct sampling mods, and tuners other than the R820T, as it touches all those areas but I only have an unmodified R820T to test against. If you have different hardware and are willing to spend some time testing then please let me know. I expect that the range of the other tuners can be extended in the same way with not much trouble. Over on the Reddit RTL-SDR discussion board there has been talk about this patch. 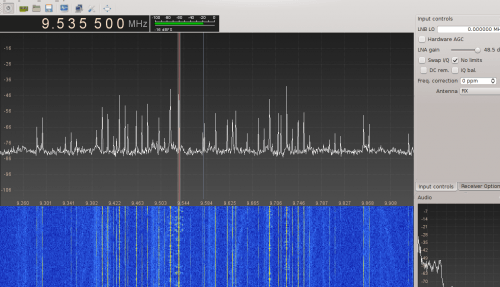 Most users are reporting that it works well down to around 15 MHz, but some people are reporting that they have been able to receive signals down to around 4 MHz. Testers also report that this modified driver works much better than the no-hardware direct sampling mod patch released a few months ago. Update: A ready to go Windows binary for SDR#can be downloaded at https://mega.nz/#!K0YwyLDb!jMdJb2DwjMTnyDFZ-mda5mQfcu464gB945eQnOJj82g. Simply copy the file in the zip into the SDR# folder. Need a direct connection to the antenna?